The multi-dimensional nature of the 2030 Agenda has encouraged a re-examination of programme and service delivery models developed prior to its adoption, with a view to delivering more coherent and integrated support. The continuing drive for cost-effectiveness, timeliness and quality of service delivery places a strong emphasis on efficiency as well. UN DESA delivers its capacity development support in a variety of ways through a variety of funding and delivery mechanisms, adapting its services to different circumstances and requirements. With a pool of more than 200 experts, including dedicated inter-regional advisers, UN DESA focuses most of its capacity development efforts on developing well- tested methodologies, tools and approaches that can assist national policy makers build the necessary capacities to translate the new sustainable development framework into concrete policies and plans. As appropriate, these tools, models, and innovative approaches are tested in pilot countries, in collaboration with national authorities, through a combination of global, regional, and national interventions conducted in collaboration with strategic partners. National beneficiaries and relevant partners are also trained as “trainers” in the context of longer-term and larger scale interventions. 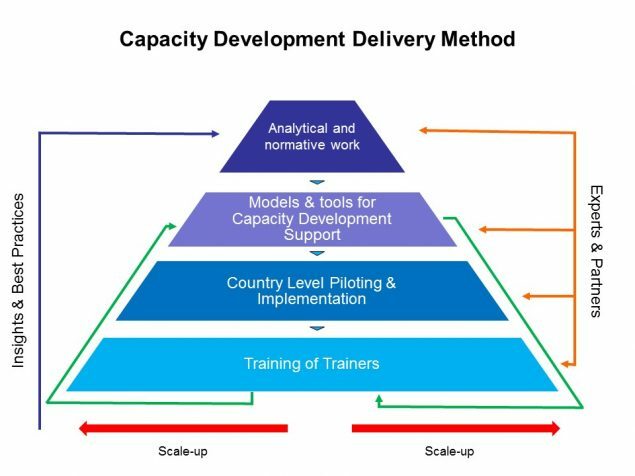 Partners, especially in the case of UN agencies with large country presence, facilitate the continued follow-up and sustainability of these capacity development interventions at the country level, since UN DESA is a non-resident entity. They also help bring these interventions to scale by training national stakeholders in other countries and continuing to disseminate these tools globally and regionally.